Save money with our most popular option, where groups of up to 15 people can book the entire party bike for a two hour fun-filled private pedal party in the downtown Tucson bar and entertainment districts! 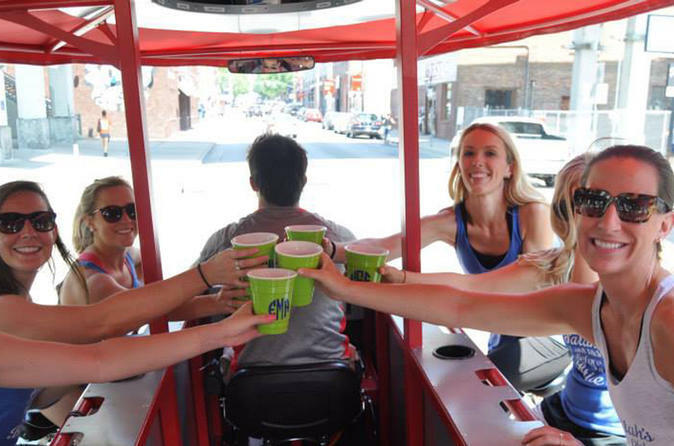 With exclusive drink specials at our partner bars, and BYO legal on our party bike, all eyes will be on you as you're raising your cans and solo cups while pedaling and partying at the best that Tucson has to offer! 2 hour private pedal party for up to 15 people — we provide the driver! You can bring your own beer and wine on board just like a party bus! Get exclusive VIP drink specials when you stop at one of our partner bars! The bike comes complete with rocking sound system, LED party lights, and electric assist motor to keep the party going. The corridor of University Blvd, 4th Avenue, and Downtown is known for its nightlife and the best Tucson bars — and the party bike is the ultimate way to experience it! Go on a bar crawl and stop at a few of your favorite watering holes, or let our party bike pilot show you all the cool spots for drinks and a bite to eat. Party with friends and woo at locals as you ride and drink through the downtown Tucson bar district in style! The private group party options is perfect for any day or night out on the town, tourists visiting Tucson, bachelor and bachelorette parties, birthdays, company teambuilders, and conference groups!